Now I have writ of my birth and bringing up, and of how I came to be a poet and a spy, I will tell how I pass my days. There is a brinded cat here that did nowt but torment me. He did not bristle up when he saw me, but contented hisself with persecuting me most sly and suttle. For wherever I found a pleasing place to sit, when next I went there he were in it. And when I found another, he would claim that too. This happened many times. And he crept up to my young lady’s chamber, and left his mark on the door. I over-marked him, but his misfeasances [ill doings] left me mopish. Today the sun came forth, so I stepped out to take the air upon the garden wall. 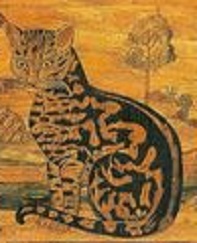 This brinded cat came and sat not far from me, with his paws folded under his breast and his tail wrapped neat about him. Most peaceable. I believed we might be friends. Then he bent his head to sniff the wall beneath his nose, gave me an evil look, and sniffed the wall again. Like the very stone whereon I’d trod was foul to him. I never knowed such insolencie in all my life. I puffed up, laid back my ears, and stepped most prideful along the wall. A cat of honour (which I am) will advance slow and sideways so our enemie may see us well, reckon our strength, and yield if he so chooses. The rascal rose to meet me. His fur rose with him. He gave me the look direct, and I returned it. I had at him then, and knocked him flying. We fell to the ground, righted ourselves, and went hard at it. I gave him many good kicks in the belly, and he gave me some too. Oh, how our fur did fly! I kept him down and whispered that if he did not tell me where in that house the cheese-wits [Jesuit priests] were hid, I would bite his head off. I let the rascal rise, and stood firm while he walked away. He stepped very slow, like one who went because he wished to, not because I beat him. For it come to me that my maggot was not an evil worm like the one that turned the old Earl’s wits and consumed him with wild fancies. My maggot was like to a pretty bee that lent its honey to my tongue and its wings to my words. But even as I spoke, I grew mopish again. For that spy Master Grey had called me a country clown, and sayt my tales were fool. I fear his unkind words have driven my maggot out. And without my sweet maggot, how can I be the young Earl’s poet? 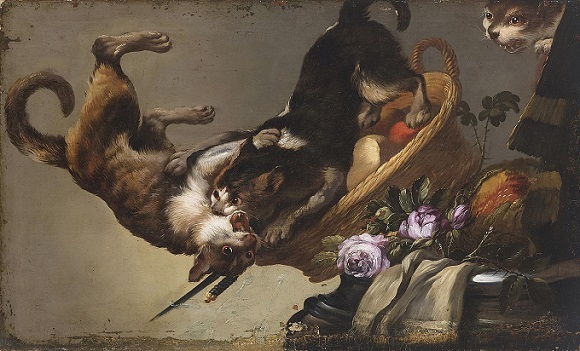 Fighting Cats – workshop of Franz Snyders (1579-1657). This fight seems to be about who will have the food basket. In sooth, I would fain die than lose my sweet maggot. Me too. Impudencie and a sweet maggot – what more does one need? P.S – I did a minor edit on your comment – you typed “die to” and I thought, oh, he means “die than…”. (Unless your Muse has driven you to despair.) But if I got this wrong, let’s know and I’ll change it back to your original. I love the idea of Jesuit priests being cheesewits. They scare the Bejasus out of me. I can’t think of any group less deserving of being called cheesewits. But I can see that “Jesuits” would sound like “cheesewits” to a cat.